The Aussie dollar maintains positive tone and holding near two-month high at 0.7205 at the beginning of US session on Wednesday. 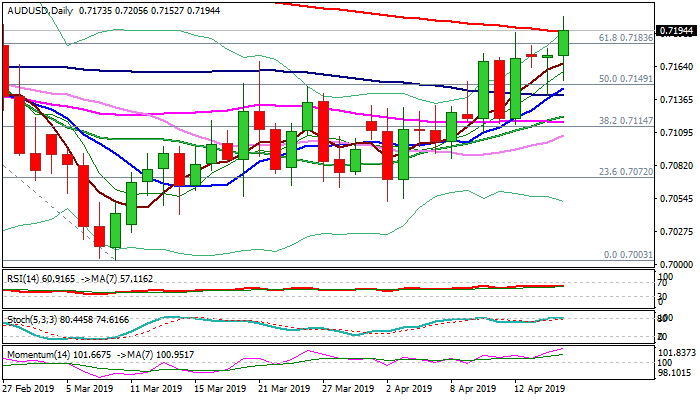 Stronger than expected data from China that showed faster than expected economic growth, boosted Australian dollar for probe above key barriers at 0.7183/93 (cracked Fibo 61.8% of 0.7295/0.7003 descend / 200SMA). Fresh bulls signal continuation after the price action in past two days ended in Doji candles, with Tuesday ones being long-tailed. Close above cracked Fibo barrier (0.7183) is needed for initial bullish signal, while sustained break above 200SMA (0.7193) will confirm break and unmask targets at 0.7226 (Fibo 76.4%) and 0.7270 (weekly clod base). Improved sentiment after data adds to positive techs which maintain strong bullish momentum. Caution on overbought slow stochastic and bearish divergence forming that could have stronger impact on bulls if Aussie fails to eventually close above broken Fibo barrier at 0.7183. The information contained in this document was obtained from sources believed to be reliable, but its accuracy or completeness cannot be guaranteed. Any opinions expressed herein are in good faith, but are subject to change without notice. No liability accepted whatsoever for any direct or consequential loss arising from the use of this document.